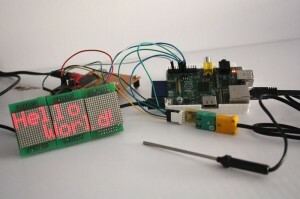 Photo 1: Hello world, using the WiringPi library to control an LED display. To celebrate getting the GPIO working using WiringPi from Gordon Henderson I thought I’d have a quick look at the difference between running some code on an Arduino compared to running almost the same code on a Raspberry Pi (RasPi). It is worth noting now that the setups I’ve been using to test with are all powered from a separate 3.3V supply with the grounds linked. 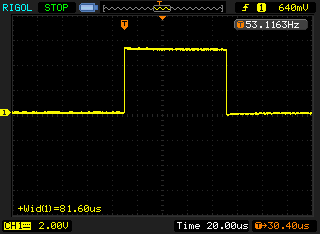 Nothing is being powered via the RasPi itself to avoid drawing too much current should I make a mistake. When working with the RasPi you should be careful as the RasPi will not take kindly to static discharge, connecting things backwards or the wrong voltage levels. The really great thing about Gordon’s library is that by using it I am able to transfer Arduino code to the RasPi with only a few simple changes. Obviously not everything in the Arduino libraries are present, but the basic I/O manipulation is plenty for some simple applications. 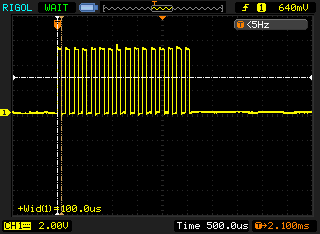 The MAX6675 from Maxim is an SPI Bus based thermocouple convertor that I built a breakout board for a while back. You can find out more information about that project in this earlier post. As a simple test I took the basic example from the MAX6675 thermocouple interface library and adapted it to run with the WiringPi library on the RasPi. I initially ported the example and library to C as the WiringPi was in C and I had a couple of issues compiling mixed C and C++ properly. After a bit of investigation I found that when explicitly including the libraries as C the compiling problems go away. Below is an example of how to modify the wiringPi.h file to ensure it is included as C and not C++. Gordon has said he will make this change to the library on the next release. Once I had sorted out the makefile to use g++ rather than gcc I was able to compile and link successfully. While compiling and linking of the example was now okay, the next problem was that when run, the program just exited with a “Segmentation Fault” (segfault). I didn’t even see the error message when running as root with sudo, it was only when running as the standard user (pi) that it became apparent that something was wrong with the software rather than the hardware. When I had run previous examples as the standard user I would see a permissions related error complaining that the program could not access the “/dev/mem/” device. This error comes from the part of the WiringPi library that sets up memory access to the hardware registers in the Broadcom BCM2835. This clue told me that the wiringPiSetup routine was not being run. This in turn showed me that the global object representing the temperature sensor was being constructed before the WiringPi library was being setup. The solution to this particular problem was simple enough. I edited the MAX6675 library so that it calls wiringPiSetup directly when initialising. I also set an internal flag if this succeeds. In addition to this I modified the methods to exit with an error if the flag has not been set. This means that none of the MAX6675 library methods should ever call WiringPi functions without the appropriate initialisation having taken place and succeeded beforehand. My code for this example is here. A more general solution might be to add this flag to the WiringPi library itself. Following my success with the temperature sensor I decided to push the boat out a little further and try to interface to my MLMC LED display system. The MLMC LED display is a set of LED dot matrix control PCBs I designed to use up some unusual LED modules I had lying about. You can get the full story in this blog post or on the website. This was a simple demonstration with the RasPi reading from the thermocouple interface and then displaying the temperature on the display. For this example I wrote everything in C. The MLMC interface is very simple and involves clocking 16 bit words of data using two pins, one for data and one for clock. 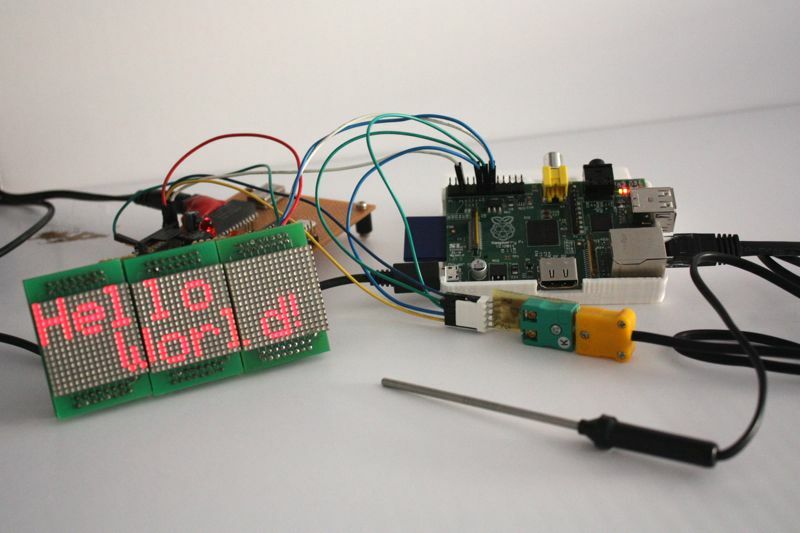 Each word represents a single column on the LED display. This low speed (~5Kbps) synchronous protocol was originally implemented by directly manipulating the digital I/O pins on the Arduino and so was very simple to port to the RasPi with the WiringPi library. While the ported program functions very well, the waveforms obtained from the RasPi are quite different to those achieved with the Arduino. This is a good example of how the same simple code can be quite different when ported between platforms. The function used to send serial data to the MLMC is shown below. 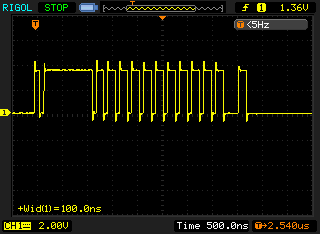 This code has a 75µs delay between switching the level of the clock and this gave uniform pulses on both systems. The pulses also appeared consistent from one run to another. 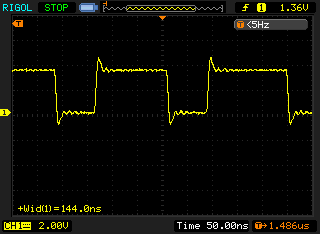 Arduino has a total pulse time of approximately 80µs for the first clock pulse to MLMC. This extra 5µs I assign to the time taken to call the digitalWrite function, a single shift operation and iterating the for-loop. There might be a bug in the way the delay function is implemented. The shift and for-loop iteration might have compiled in a very inefficient way. The operating system simply cannot schedule other tasks quickly enough to return from nanosleep and meet our expectations. 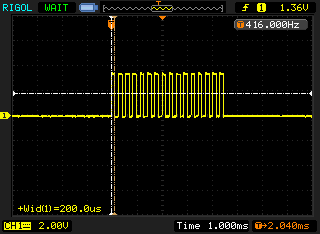 This loop was clocking data in from the MAX6675 chip via a “bit-banged” interface. The main loop did not have a delay and was toggling bits as quickly as possible while shifting in the value via a single GPIO pin. 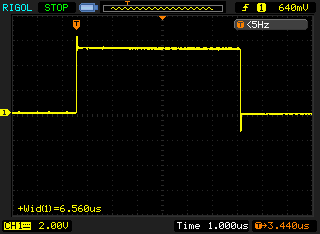 The following traces in figure 5 and figure 6 show the results on the Arduino. The RasPi on the other hand gave a very non-uniform pulse train. As this is synchronous communication, the clock does not need to be uniform, it dictates when the data line is read. 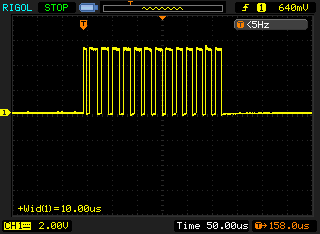 The average pulse in this waveform is only 150ns wide which is approximately 48 times faster than the Arduino. Given that the RasPi clock speed of 700MHz is roughly 44 times faster then the Arduino clock speed of 16MHz, this makes sense. 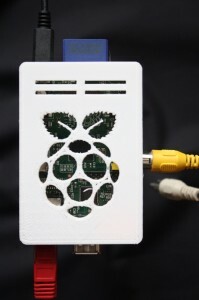 The RasPi would vary any individual pulse length by up to a factor of two (from observation) but did not seem to be effected by increasing the load (multiple ssh sessions and running an openssl speed test). The RasPi would also continue to run the MLMC scrolling display and reading the temperature sensor without issues while another process was also reading the temperature sensor at the same time (single_temp.cpp from first example above). Even while openssl was doing speed testing (cpu usage at 98-99%) the visible operation of the screen was not effected. The long delay and changing pulse widths could be investigated further with a couple of short programs. I could investigate the long delay further by looking at repeating the test with the system under different loads and noting the effect on the width and consistency of the pulses. To vary the workload on the RasPi I could use a tool like stress. We could also step through many values while keeping the system load constant. This would give us an idea if their was a minimum overhead experienced by the delay function or if their was some sort of error in the calibration. I will leave these as an exercise for another day as plenty of work has already been done on this sort thing before, although not specifically on the RasPi. This was a very quick look into porting code from Arduino to Raspberry Pi. I found that it was not so difficult to port some very simple applications, the majority of the code would simply run unchanged. While the code may compile and run, the actual operation of the code will always need to be checked carefully for timing issues and other unexpected behaviour when switching hardware and using new library implementations. As these systems were using synchronous serial communication the exact shape of the waveforms did not actually need to be uniform for the system to work. On review of the MAX6675 data sheet the timings slighty exceed the stated maximum clock freq of 4.3Mhz. So If I was intending to use this further I would introduce a short delay into the MAX6675 clock routine to ensure it complies with the data sheet. The MLMC module operates perfectly with the timings achieved but we are operating at half the throughput we expected due to the delay function not operating identically to the same function on the Arduino. While this didn’t cause a problem in this simple test it could easily have done so in a slightly more complicated system. First order of business was to boot up and try out the various distributions currently offered. On first boot I was a little disappointed to find the RasPi had a few issues with my SD card. When booting the Debian distribution I saw lots of errors when booting. The errors were “mmc0: Too large timeout requested for CMD38!” which I believe are to do with the time the card takes to erase blocks. The card was one I bought very cheaply at a market when I was on holiday in Italy a few years ago so I wasn’t that surprised to see it fail. When I switched to a newer card it behaved normally and the errors disappeared. The SD card images are available from the Raspbery Pi downloads page via bit-torrent. This is the recommended install and comes with an X-Windows GUI using a fast, light-weight desktop environment (called LXDE). The image booted into the standard text mode login prompt. After logging in I started the GUI by typing startx. I was a little surprised to find the ssh server not running by default but that was easily fixed. As I don’t have any HD TVs around, the composite video output works fine but its not ideal to do command-line work. By starting up ssh I’m able to login and develop on the RasPi using my laptop or other computer. Other than the ssh daemon not being run at boot and having to login and manually start the GUI this distribution behaved as I expected. It’s standard Debian and behaves as such, being able to apt-get anything I tried from the repositories without problems. I’ve not worked with this distribution before so didn’t do much more than boot up and see what was installed. As expected this booted into text mode as there is no GUI installed at all. As ssh was running and the Ethernet interface was working out of the box I was able to log in remotely and poke about without any problems. This is a very basic install, without even another user other than root. I like this cut down system as it seemed very fast with a low memory (both RAM and SD card) footprint. It looks like it will be a good starting point for an embedded server project. Having no experience with the pacman package management system I didn’t investigate very much at all, but think I think I will have another look at this distribution in the near future. The QtonPi image was the largest of the three images to download, but that is because as well as an image for the SD card it also contains the cross-compilers needed to develop for embedded Qt on ARM via your standard x86 Linux machine. In addition to the compilers and Qt libraries it also contains tools for making new SD card images. This is helpful when looking through logs or trying to figure out what files you just changed. Like the Arch Linux image previously mentioned this distribution also had no X-Windows GUI installed. This image is designed to use the Qt libraries to draw direct to the framebuffer. This is great for embedded systems as you don't have the overhead of a full X-Windows installation. After following the QtonPi "getting started" instructions from here I could not get the Qt5 "Hello World" example to do any more than produce a white screen. Poking about the system I found some examples already on the card. Some of these "segfaulted" when run while others appeared to have the framebuffer off-centre and while displaying a little text, would not operate as intended. The workflow for this project seems very nice and well thought through. Developing on the host and then automatically running on the target seemed very slick from within the QtCreator IDE. I look forward to working with it as the Qt5 platform matures. NOTE: the QtonPi wiki pages seem to be moving about so here is a link to the Google cache version of instructions I followed. The second order of business now that I had an operating system was to get a case printed. I chose v12 of "thing" 16104 with the large Raspberry Pi themed ventilation holes. It printed okay but it took a couple of attempts with slic3r to get it to slice the thin walls correctly. I also needed to move a couple of the connectors to make things fit nicely. I did this the old fashioned way with a file and knife but altering the OpenSCAD model looks pretty straight forward, so I'll probably do that before I print more cases for other people. Third on my hit list was to check the drivers are present to talk to my RepRap 3D printer and other serial bits and pieces I have lying about. 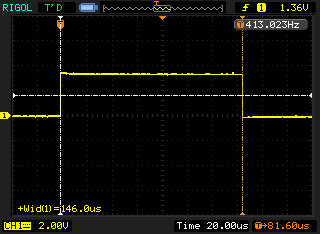 Both prolific USB to serial (PL2303) and FTDI seem to work fine. I didn't test the devices thoroughly, I simply noted that the drivers was installed and new /dev/ttyUSBx device was created when I plugged them in. I'll probably look at using the GPIO to control my RepRap and other electronics directly but for the immediate future, serial comms to an Arduino will do just fine. Last on my list was GPIO. I would like to use the RasPi as a real-time controller in embedded systems so I am quite curious to see if I can do anything useful with the GPIO. Later I plan to use it to drive the RepRap directly so I can repurpose my Linux machine in the workshop to do greater things without interrupting the printing process. While using the information from http://elinux.org/Rpi_Low-level_peripherals I wasn't able to get anything to happen on the GPIO but as this was a late night investigation I'll assume there was something simple I overlooked.